Many thanks to everyone who has already paid their subscription. If you intend to renew this year and have not yet done so, I would be grateful to receive payment by 22nd August 2016 at the following rates: £15 (Full), £5 (each additional member at the same address), £6 (Student). My address is on the last page of this newsletter. It is not necessary to return the renewal form enclosed with the March newsletter. A piece of paper with your name, postal address, telephone number and email address (if applicable) will suffice. I will then be able check the details we hold are still correct. It would also be helpful if you could indicate your willingness to receive the newsletter by email. This helps to keep our costs to a minimum. Thank you. For the academic year 2016/2017 HADAS is again running its post-excavation course, this year entitled "Finds in Focus". This course will concentrate on re-analysing, identifying and recording finds from the Birkbeck excavation at Lant Street in 1999, as well as re-boxing, re-bagging and relabelling the artefacts to bring them up to Museum of London archive standards. The course will be tutored by Jacqui Pearce BA FSA MIfA and will take place on Wednesday evenings from 18.30 for two hours at Avenue House, 17 East End Road, Finchley, N3 3QE. There will be 22 sessions with a term break in December. The cost of the course will be covered by a donation to HADAS of £295. The course starts on Wednesday, 28th September 2016. There are up to four places remaining on the course. If you would like to join please apply to Don Cooper at the contact details on the back page. The places will be allocated on the basis of first come first served. Do come and join us. Simon Williams has alerted us to a couple of interesting courses. Both started on June 20th, but it should be possible to catch up, at least with the first one. And both are FREE. From Southampton University: Archaeology of Portus: Exploring the Lost Harbour of Ancient Rome - How ancient artefacts, written evidence, excavation and digital technologies are transforming understanding of this harbour. (The Roman harbour city of Portus lay at the heart of an empire that extended from Scotland to Iraq. Established by Claudius and enlarged by the emperor Trajan with spoils of the Dacian wars, the port was the conduit for everything the city of Rome required from its Mediterranean provinces: the food, and particularly grain, that fed the largest urban population of the ancient world, as well as luxuries of all kinds, building materials, people and wild animals for the arena. Although the site lies in ruins, it has some of the best-preserved Roman port buildings in the Mediterranean, and this will cover interpreting these and the finds discovered within them using primary research data and the virtual tools of the archaeologist. From the University of Reading: Archaeology: from Dig to Lab and Beyond, exploring exciting discoveries in the Vale of Pewsey, with a virtual field trip charting the university Field School’s month-long excavation in the Vale, a relatively untouched site compared to its world-famous neighbours, Stonehenge and Avebury. And charting the progress from field to lab. The 55th Annual General Meeting was held on Tuesday 14th June 2016 at 7.45pm. The meeting was attended by 30 members and 1 guest which was somewhat fewer than last year but apologies were received from a further 28 members whom I thank for responding to the request in the Newsletter. The Chairman, Don Cooper opened the meeting and welcomed all those present, including the President, Harvey Sheldon. The President was then invited to take the chair to conduct the business of the meeting. The six current Committee Members were also prepared to stand again and were duly unanimously elected. They are Vicki Baldwin, Bill Bass, Roger Chapman, Eric Morgan, Andrew Selkirk and Sue Willetts. The Secretary reported that Sheila Woodward, a long standing member, was at present in hospital and Dot Ravenswood was in a nursing home. The Treasurer registered his concerns as to the future of the Society due to the lack of volunteers to help with the organisation. The present occupants of the offices have served for a number of years. He also made members aware that their subscription barely covered the cost of the Newsletters each month and that we were greatly indebted to the legacy of Ted Sammes. The cost of the AGM alone is over £200. It would serve the society well if existing members could recruit some new members. The Chairman reported that HADAS will again be digging at Clitterhouse probably late July. The Finds Group continues to thrive and will be studying the finds from Lant Street. Hendon Baptist Church has offered the use of their hall free of charge for HADAS to host an open day for people to bring in finds and also see some of the local finds which HADAS has in its possession. The proposed date is Saturday September 3rd. The Vice- Chairman was also thanked for all his work scrutinising planning applications and responding to the need to set archaeological conditions. The meeting closed at 8.10pm. The Chairman then invited the President Harvey Sheldon to deliver his talk on the Rose Theatre ‘The Rose discovered and the Rose revealed’. This talk will be reported in a future Newsletter. Totteridge is situated on the ridge of high ground between the valley of Dollis Brook and its tributary, Folly Brook, in the southern extension of Hertfordshire into Middlesex. The curved edge of the churchyard may indicate that the first church built here was on a site already well-used by local people since ancient times. That this may have been a sacred site is strengthened by the presence in the churchyard of an ancient yew tree (pictured below).This is estimated to be between 1000 and 2000 years old and may be the oldest tree in the Greater London area. It may be older than the first church on the site, which is mentioned in a document dated 1250AD, recording that Totteridge Church belonged to St Etheldreda’s, Hatfield. St Etheldreda, daughter of Anna, King of East Anglia, was born at Exning near Newmarket in 636AD. She founded a monastery at Ely, which had been part of her dowry, and later retired there. Her shrine was at Ely Cathedral but was moved to the chapel of the London residence of the Bishops of Ely at Ely Place, off Charterhouse Street, Holborn. This chapel, now known as St Etheldreda’s Church, is a rare survivor in London, having been constructed between 1250 and 1290 during the reign of King Edward 1. The attached gardens were said to produce the finest strawberries in London and are mentioned in Shakespeare’s Richard III. It was King Edward 1’s grandfather, Saxon King Edgar, who seems to have given Hatfield (along with Totteridge) to the Abbot of Ely when the monastery was refounded. So this is why the church at Totteridge was initially dedicated to St Etheldreda, the name gradually being shortened to St Audrey. The change of dedication to St Andrew may have been at the time of the Reformation when biblical saints were more popular. It is interesting to note that in manuscript form, Audrey and Andrew can be quite similar! In 1650 it was suggested that Totteridge be detached from Hatfield but this did not actually take place until 1892, the new parish then containing 785 inhabitants. The Churchwarden’s Accounts and Vestry Minutes began in 1613. Various repairs carried out to the fabric of the building are recorded, including those resulting from a week-long storm in November 1703 which swept away the first Eddystone lighthouse and demolished hundreds of windmills. The church weathervane is dated 1706 and it is possible that the original was destroyed in this gale. The church itself had to be rebuilt in 1790, apparently by architect William Ketteridge. It is a plain brick building with a weather-boarded bell turret dated 1706 which had come from the previous building. Inside the church are a number of memorials which refer to members of the family of the great uncle of Samuel Pepys, diarist. Sir Lucas Pepys was physician to George III and president of the Royal College of Physicians. 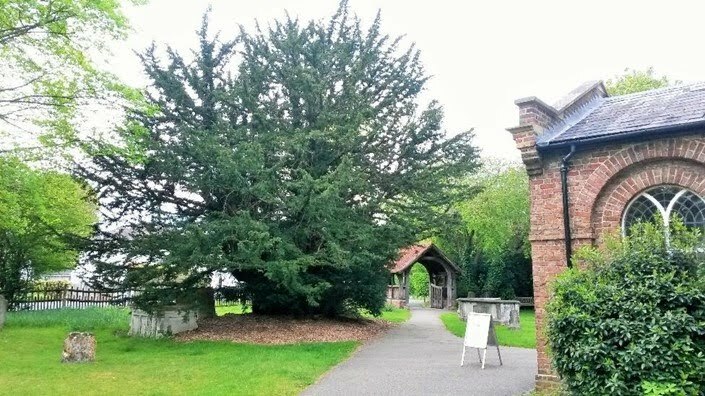 The lych gate to the Churchyard dates from 1930 and was erected in memory of Lady Barrett of Totteridge Park. This 18th century house is located on the site of what was a residence and private chapel belonging to the Bishop of Ely in the 14th century. Totteridge parish records dating from 1546-1966 are held by Hertfordshire Archives and Local Studies, County Hall, Pegs Lane, Hertford, SG13 8EJ. Transcripts of the baptisms 1570-1837, marriages 1570-1836 and burials 1570-1837 are available at Barnet Local Studies Centre, Hendon Library (first floor), The Burroughs, London NW4 4BQ. Images of baptisms 1546-1903, marriages 1754-1789 and burials 1570-1937 are available on payper-view site FindMyPast. London Westminster & Middlesex Family History Society has produced a fiche of St Andrew’s Memorial Inscriptions: NMP 29 includes St Andrew MIs & the burial register plus the Dissenters Chapel, cost £1.50. Only 3 left. See Dec. METROPOLITAN for details if you would like one. The Church has detailed plans of the burial ground and if you would like to know the position of a particular grave, you can email Richard Peart on: rwpeart@care4free.net for assistance. There is a statutory fee for this service. This article first appeared in METROPOLITAN, the journal of the London Westminster & Middlesex Family History Society. Below are more findings from the Clitterhouse Farm excavation last year. Now HADAS has obtained permission to dig there again, around Wednesday 20th to Wednesday 27th July (to be confirmed). If you are interested in taking part please contact myself (bill_bass@yahoo.com, 020 8449 5666) or Don Cooper (details back page). Further details will be sent later via email. Site code: CLM15, Clitterhouse Farm, Claremont Road, Cricklewood, NW2 1PH NGR: TQ 23689 86819, SMR: 081929, Site investigated July/August 2015. For background on this project please see HADAS Newsletters 539 (Feb 2016), 542 (May 2016) and 543 (June 2016). Geraldine Missig has kindly supplied this report on the Animal Bone and Marine Molluscs from Clitterhouse Farm. Reference should be made to Newsletter 542 (May 2016) for trench and context locations. A comprehensive database of the bone and mollusc finds, also by Geraldine, lies with the archive. Records as far back as 1584 describe Clitterhouse Farm as a working farm, which continued operating in different configurations up to the early 20th century. In July 2015, HADAS opened three trenches on the old farm’s grounds at Claremont Road, London NW2 1PH, (CLM15). A small assemblage of 78 identified animal bone specimens weighing 1449g, and 20 marine molluscs fragments weighing 158g was recovered. In addition there were 57 unidentified fragments which weighed 262g. They occurred only in contexts (T1/005) and (T2/002) and consisted of 43 cattle - sized fragments weighing 237g, and 14 sheep/goat sized pieces weighing 25g. The animal bone fragments were identified by reference to the bone collection at Birkbeck, University of London and recorded on a spreadsheet as to species, anatomical part, side, state of fusion (following Schmid 1972), proportion of bone present, weight, and any modification such as dog or rodent gnawing, burning or butchery. The marine molluscs were also counted, weighed, identified, and recorded. Oysters valves were separated into left and right; their condition too friable to reliably note cut marks. Each identified specimen was allocated a specimen number (SpNo) and where two pieces joined together they were counted as one. Only sheep/goat teeth were recovered. However, they were all too damaged to apply in any detail the Payne (1973) age attribution to their wear stages save to note that one was mature. Sheep and goat (caprine) bones are morphologically similar though some bones display features which can distinguish between the two. These characteristics have been described by Boessneck (1969) and applied to the relevant caprine bones in CLM15. This was possible only in two instances, a distal humerus in (T1/005) and a distal metacarpal in (T2/002), both of which were that of sheep. Small numbers of marine molluscs, in the form of nineteen oyster valve fragments and one large whelk shell, were present in all of the contexts except (T1/005), a context whose bone was noticeably poorer preserved than any of the others. The abraded state of its bones prompts the concern that should any oysters have in the past been within (T1/005), they may by now have been reduced to nothingness. The edges of oysters in the contexts with better preserved bones are disintegrating into powder, extinguishing at the same time any traces of any marks that would have been left on the shell if they had been prised open. The nineteen valve fragments can be broken down into twelve right, the flatter, thinner half, and seven left, the curved, deeper part in which the meat of the oyster rests and is served. Four of the right valves weighing 10g and the whelk weighing 11g came from undated contexts recovered from the topsoil. The remaining oysters came from the contexts dating between 1800 and 1900, according to the pottery sherds retrieved with them. Contexts (T2/002) contained two left and two right valves while (T3/005) had six left and six right. Although a surprisingly even distribution of left and right valves, the fragmented state of many of the valves precluded the identification of any pairs. 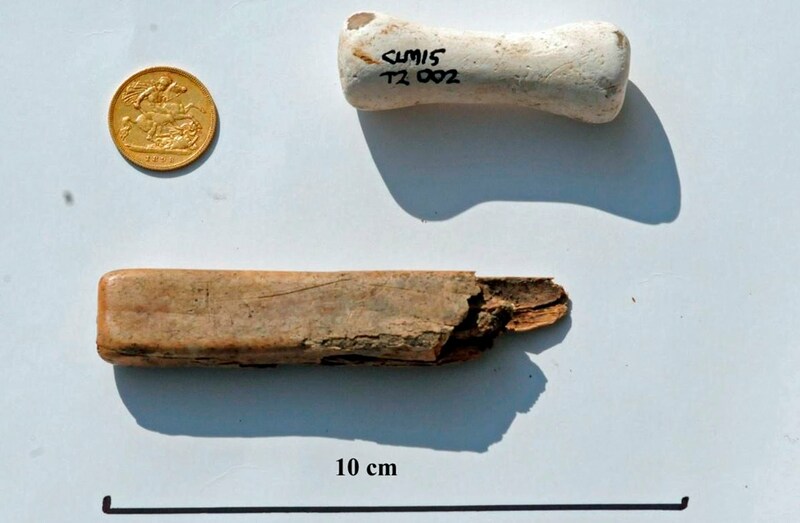 The three (131g) animal bone fragments found in the topsoil contexts, (T1/002) and (T2/001), were small, butchered, dog-gnawn fragments of cattle and sheep/goat meat bearing bones. Their reduced size and butchery marks suggest human processing. Indeed, the sawn off unfused head of a young, less than 4 years, cattle femur resembles the butchery waste of an awkward, unwanted portion of a good quality meat bone . This is supported by the presence in the group of four right oyster valves, the flat side removed probably in preparation before service. Dog gnawing on the fragments and their presence near the ground surface in the topsoil suggest very little effort was made to properly dispose of these, following use at some unknown time. Trench 2 was located against the wall of the existing farm complex in an attempt to discover its relationship with the formally laid gardens depicted in that area on plans of the farm complex after 1816. Trench 3 was placed approximately 15m northeast of it in a bid to pick up any evidence of a body of water or an old ‘moat’ which was known to have at least partially encircled the farmhouse up till the late 19th century. Although coming from these different trenches, two of the contexts, (T2/002) and (T3/005), share a similar soil composition, firm grey/brown silty sandy clay, and have similar OD levels. The artefacts in the contexts include not only animal bone but pottery, glass, worked bone, clay pipes, iron and building materials, an assortment of dumped material. 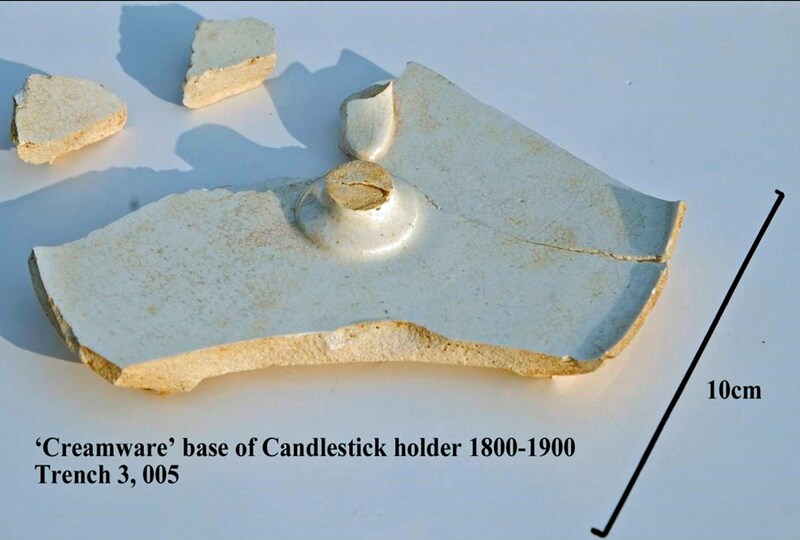 From the pottery sherds found within each context, similar dates of between 1800 and 1900 have been assigned them. The animal bones in each trench, while differing in some details, appear mainly to be the products of butchery waste with a bit of slaughter remains. However, as the fragments are few, caution should be exercised before regarding them as representative of what was deposited in the surrounding ground or of the activities that were taking place there at the time. Corroboration with greater numbers would be needed. Of the twelve fragments in (T2/002), sheep/goat is predominant at 67%, with cattle at 17%, and pig and domestic fowl each at 8%. In this context was one of the bones with features capable of distinguishing sheep from goat, a distal metacarpal which was that of a sheep. There is evidence of butchery on 54% of the fragments, although 75% of the fragments in the group amount to only 25% or less of the original bone. The disposal of the bone waste appears to have been effectively managed as only 25% exhibit dog gnawing marks. Many of the fragments are those parts of a bone which are removed before consumption, making it likely to be waste following butchery. A broken upper second molar of a mature sheep/goat suggests in addition slaughter waste. Of the thirteen fragments in (T3/005), cattle is predominant at 69%, with pig at 23%, and sheep/goat at 8%. There is a level of butchery equal to that in (T2/002); however less fragments are processed to small pieces with only 46% being 25% or less of the original bone. This suggests that the purpose of the butchery may have been dismemberment with two unfused calf’s skull fragments as slaughter waste. Sixty nine percent of the fragments in (T3/005) are from small, young cattle and pig, each a minimum number of one individual. An unfused acetabulum (pelvis) indicates a calf less than six months, and a complete pig radius (lower foreleg) unfused proximally and distally points to an animal less than a year old, though its small size would suggest an age more in the middle of that range. Dog gnawing marks were low at 15%. The excavators considered it likely that the ‘moat’ feature had been located as the base of (T3/005) appeared to be a ditch formation falling sharply down to natural in the place where the old ‘moat’ was thought to have been. Proximity to water would have been useful if the area had been used for the slaughter of animals and the dismemberment and processing of carcasses as possibly hinted at by the animal bone in the two contexts. Equally, a nearby body of water is a convenient place to dispose of unwanted things. Trench 1 was located approximately 13m west and slightly south of Trench 2. It was placed in an area thought to be near to the site of an old barn and adjoining stable mentioned on an 18th century map as requiring repair or demolition. 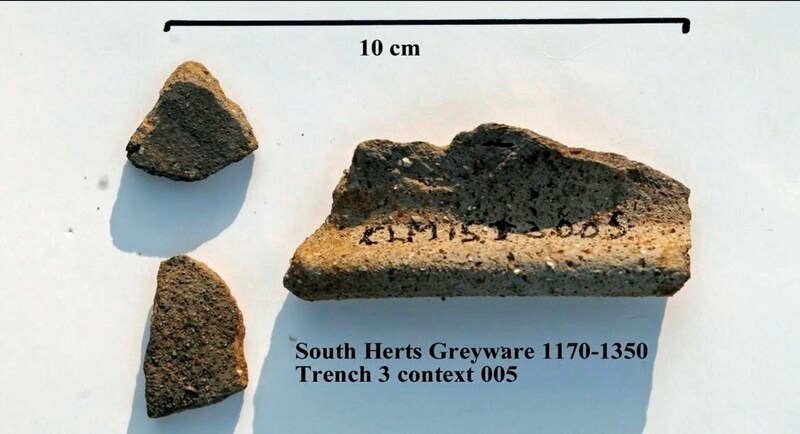 While higher layers in the trench contain pottery with later dates such as Surrey/Hampshire border ware (1550 -1700), Frechen stoneware (1550 - 1700) and post medieval red ware (1580 - 1900), the animal bone was found in the deepest context, (T1/005), lying over natural. With it were loose worn cobbles, at least four sherds of jar bases of Raeren stoneware (1480 -1610) and nine sherds of tinglazed ware type A, (1612 - 1650). All were sealed beneath a beaten chalk floor 5 - 8cm thick (T1/007) which spanned the extent of the trench suggesting that the animal bone, pottery and cobbles of (T1/005) were a make-up layer for the floor (T1/007). This type of floor may indicate a working surface. An adjoining ‘old barn and stables’ are depicted on a c.1790 – 1816 plan with the stables segment in the vicinity of Trench 1 raising the likelihood that (T1/007) may be part of the floor surface of the ‘old stables’. Even today a crushed chalk floor is thought a good base for livestock as it is warmer and kinder to the animals’ feet than concrete. It is also absorbent, drains well keeping quarters dry and neutralizes odours. As mentioned above, the bone fragments found within the group were in poor condition, possibly as a consequence of the type and volume of liquids seeping through the chalk floor. Their surface was abraded masking some marks. Of the fifty identified fragments in (T1/005), cattle was predominant at 62%, with sheep/goat at 22%, domestic fowl at 16%. The other bone capable of distinguishing between sheep and goats was in this context and it was the distal humerus of a sheep. The eight fragments of domestic fowl comprised the wing, leg, and small piece of breast of a minimum number of one individual. With no marks, save those of recent damage, their former use is uncertain, possibly the remains of consumption, possibly those of food preparation. As domestic fowl is processed in a different manner than cattle and sheep/goat their fragments have been left out of the following enumerations. There was evidence of butchery on 74% of cattle and sheep/goat bones, and 69% of these fragments amounted to 25% or less of the original bone. Dog gnawing of the specimens was minimal at 2%, though the bones’ poor condition may have concealed some teeth marks. There was evidence of one incident of rodent gnawing. These heavily processed fragments were predominantly butchery waste, a combination of parts removed in the preparation of meat cuts, and unwanted animal footbones - carpal, tarsal, the metapodials, and phalanges. A fragment of cattle radius (lower forelimb) and three cattle metapodials showed evidence of additionally being worked waste. These worked metapodials were highly fragmented with the three bones formed from nine pieces. Metapodials were frequently used in bone working as they are strong and well shaped for working. Present also was a small group of butchered cattle skull fragments, an indication of animal slaughter. The waste nature of the bones in (T1/005) would be consistent with their final function as a probable levelling layer for a floor. Although the CLM15 bone assemblage is a small sample, it has, on the whole, been a consistent one with the bone fragments predominantly the consequence of butchery with some slaughter waste. Additionally, the earliest dated context, (T1/005), includes worked waste. The low quantity of bone fragments in the dated contexts in Trenches 2 and 3 together with the variety of other discarded materials indicate that they were not a regular dump sites while the composition and location of the Trench 1 deposit suggests that it was a makeup layer for the chalk floor. Apart from the slim presence of domestic fowl and oysters, domestic refuse has been absent from the assemblage suggesting it was disposed of in a different place. Cattle was the favoured species making up 61% of the whole group, with sheep/goat following at 26%, domestic fowl at 11%, and pig at 2%. There was no evidence of any horse bone. Although as a whole cattle was predominant, the two contexts in Trench 2 featured mainly sheep/goat fragments. Dog gnawing of the bone fragments in all the dated contexts was infrequent indicating an effective disposal of waste material. While some early maps of the area excavated show it as ‘general land’, or ‘a clear area’, the land was part of a busy, functioning farm and the uses suggested by the recovered animal bone fragments is consistent with that. In the late 18th/early 19th century Clitterhouse farm was reorganized with the demolition of old buildings and the construction of new ones in a different layout. The early to mid/late 17th century dates for the pot sherds included with the animal bone under the chalk floor in Trench 1, however, place them contemporary with the old farm, predating the farm’s rearrangement. The chalk floor with its likely makeup layer of pottery, worn cobbles and animal bone fragments (including worked waste) suggests a link to the ‘old stables’ shown on the c.1790 – 1816 plan in close proximity to the site of Trench 1. 17th century animal bone assemblage recovered from Trench 1; a reminder of the continuity in agriculture. Further excavations at Clitterhouse Farm may increase our understanding of the patterns of waste disposal for both the working farm and domestic refuse and if and how they varied over its long history. References http://www.agchalk.co.uk/ , (accessed 5th May 2016). Bass, B, and The Fieldwork Team, 2015, Excavations at Clitterhouse Farm, Cricklewood, by HADAS. (Part 2 The Excavations), H ADAS Newsl. May 2016 and (Part 3 Site phasing and other things) pers.com. Boessneck, J. 1969, ‘Osteological differences between sheep (Ovis aries Linne) and Goat (Capra hircus Linne)’, in Brothwell, D. & Higgs, E.S. (eds), Science in Archaeology, 2nd edn, pp 331 - 58, London: Thames & Hudson. The Clitterhouse Farm Project n.d., ‘The farm’ http://clitterhouse.com/thefarmtoday/ (accessed 25th April 2016). Driesch, A. von den 1976, A Guide to the Measurement of Animal Bones from Archaeological Sites, Massachusetts: Peabody Museum of Archaeology and Ethnology Bull. 1. Payne, S. 1973, ‘Killoff patterns in sheep and goats: the mandibles from Asvan Kale’, Anatolian Stud. 23, 281 - 303. Schmid, E. 1972, An Atlas of Animal Bones for Prehistorians, Archaeologists and Quaternary Geologists, Amsterdam: Elsevier. Some of the small finds found at Clitterhouse Farm, including the medieval rim and pottery from Trench 3. The 1898 half-sovereign from Trench 3, pipe-clay wig-curler from Trench 2 and a bone knife handle with remains of the iron tang from Trench 3. Thurs 7th July 7.30 pm London Canal Museum 12-13 New Wharf Rd, Kings X N1 9RT All Shipshape and Blackwall Fashion Talk by Jeremy Batch. £4 (& concessions). Fri 15th July 7 pm COLAS Romans, Wren & Rogers Guided walk with City Guide Tony Tucker. Start at St Paul’s Cathedral (West steps). Wed 20th July 7.30 pm Willesden Local History Society. Visit to The Grange, Neasden. Meet at car park on Neasden roundabout NW10, to explore the past and present of the Grange. Wed 20th July 7.30 pm Forty Hall Estate, Forty Hill, RN2 9HA Tales from Enfield History: From Poor Law to London Borough of Enfield’s 50th Anniversary Talk by Joe Studman explaining the history of parish democracy from the old manor courts onwards. £5. Thurs 21st July 7.30 pm Camden History Society, Camden Local Studies Centre, 2nd floor, Holborn Library, 32-38 Theobalds Rd WC1X 8PA The School of Oriental & African Studies (SOAS) Talk by Burzine Waghmar. £1. Sun 24th July 2 pm Jaywalks Enfield Chaseside & Gentleman’s Row Meet Chase Station, Windmill Hill, Enfield. Guided walk led by Joe Studman, looking at the conservation area. £5 (concessions £4). Wed 27th July 7.30 pm Edmonton Hundred Historical Society & Friends of Bruce Castle, Bruce Castle Museum, Lordship Lane, Tottenham N17 8NJ Old Films of Edmonton Hundred Area. Talk by Louise Pankhurst. Sun 31st July 2.30 pm Enfield Society Heritage Walk around Pymmes Brook & Silver Street, Edmonton. Led by Joe Studman. Free but ticketed. Apply with s.a.e. to Heritage Walks, Jubilee Hall, 2 Parsonage Lane, Enfield EN2 0AJ or e-mail heritagewalks@enfieldsociety.org.uk . Sun 7th August 2.30 pm Heath & Hampstead Society. Meet at Cattle Trough & Flower Stall, Spaniards End NW3 (near the pub). The Hampstead Heath Extension Walk led by Tony Gilchrist, approx. 2 hours. £5 donation. Tues 9th August.7.45pm Amateur Geological Society, The Parlour, St Margaret's Church, Victoria Ave N3 1BD (off Hendon Lane). Talks by members, incl. Clay & Brickmaking by Richard Furminger. Fri 19th August 7 pm COLAS, St Olave’s Parish Hall, Mark Lane EC3R 7LP Recent Projects on Ancient Monuments in Greater London Talk by Dr Jane Sidell (Historic England). Visitors £2. Light refreshments after.